DEREK Greenwood, 73, saw off Kieran Devlin, 27. 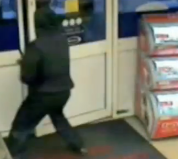 The younger man was armed with a knife when he raided the Texaco petrol station on Dill Hall Lane, Church, Lancashire. At Burnley Crown Court, Devlin, from Accrington, Lancashire, is jailed for five years. Devlin made off with £130. But when Greenwood grabbed a bottle of red wine and used it to confront Devlin, the villain panicked and dropped a bag. Police found his fingerprints on it, and justice took its course. An elderly grandfather has been hailed a hero after fighting off a knife wielding robber at the petrol station where he worked armed only with a bottle of wine.